For some time now the Gefira Team has been keeping track of the demographic processes that are taking place in Europe, especially in its Western part. This time Gefira published a report on Sweden, a well-developed, typical Western state, member of the European Union. The report includes independent calculations, using dedicated demographic software Cerberus 2.0. The report is based on the input that is taken from the official bureaus of statistics. the number of children with an Islamic name is growing at a fast pace. Since 2010 it has increased by more than 30%, so that now around 8 to 10% of the newborns in Sweden have an Islamic name. the native white Swedish population will be a minority within a maximum of 40 years. The same source shows that 22% of the newborns have a non-Western migration background. To compensate for the low birth rate the government is pursuing a systematic re-population policy. That it why it can be claimed that the Swedish community will grow in numbers at a moderate speed in the foreseeable future. The SCB statisticians cannot have come to this conclusion on the basis of the Swedish childbearing numbers nor on the global migration trends. The said growth remains and will be a result of importing highly fertile women from low and medium HDI (Human Development Index) countries. The future of the Swedish population is bleak. On the basis of official fertility and death rates Cerberus 2.0, software designed for demographic calculations, computed the number of births and deaths for each age group, starting in 1970. The number of white native Swedes grew until 1996 and from there it began to decline in a more or less straight line. In 2017 there were again 8 million people and by 2060 there will be 6.6 million Swedish people left. If the authorities are not able to turn the tide and increase the fertility rates of Swedish women, the population will decline to 5 million by the end of the century. While the calculations predict that there will be 8 million natives left now, the current official data show that there are even fewer Swedes with two parents born in Sweden. Due to the continuation of the influx of immigrants, the current population is 10 million. According to Statistics Sweden it will be 14 million by the end of this century. 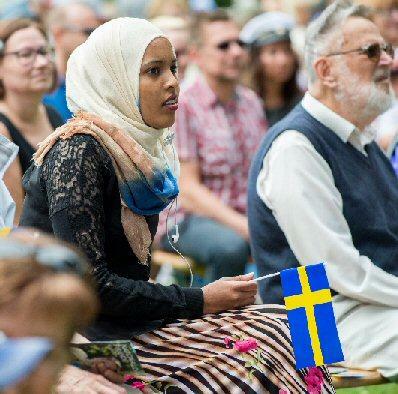 The Swedish authorities regard only first and second generation immigrants as foreigners. After one generation a sprawling Pakistani community relocated to Malmö will be regarded as natural Swedish growth. Another approach is to look at the difference between the computed population and the official numbers. If Cerberus 2.0 forecasts 7 million people in 2050 and Statistics Sweden expects 12 million, the difference is due to migrants, whether it is the first, second or fifth generation. The forecast made by the Swedish authorities is rather a blueprint or plan for the future than a prediction. 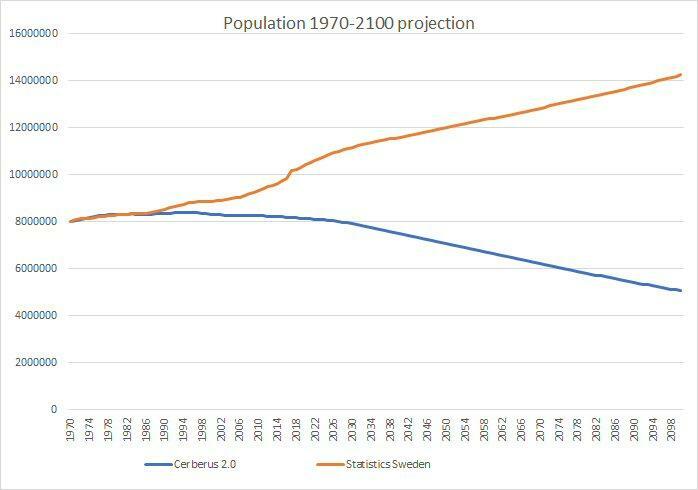 Comparing the projection made by Cerberus 2.0 and those made by the state planners, the Gefira report expects the Swedish to be a minority by 2066 i.e. by the end of this century only one-third of the population will be of Swedish descent, which means almost a total re-population.